WASHINGTON, D.C. AND CLEARWATER, FLA., (March 5, 2015) –Westchester Gardens Rehabilitation Care Center in Clearwater, Fla., managed by The Goodman Group, has received the highest possible overall rating of five stars in U.S. News & World Report’s seventh annual “Best Nursing Homes,” available exclusively at www.usnews.com/best-nursing-homes. Westchester Gardens, the premier short term rehabilitation care facility in the Clearwater area, offers a full range of services, including comprehensive rehabilitation services, physical/occupational/speech, a stroke management program, skilled nursing, and short-term stays, as well as hospice, respite, transitional sub-acute and long-term care. 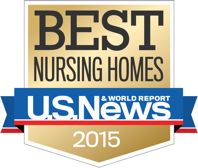 Created by the publisher of Best Hospitals and Best Children’s Hospitals, the Best Nursing Homes 2015 ratings highlight the top nursing homes in each city and state, out of nearly 16,000 facilities nationwide. The goal is to help users find a home with a strong track record of quality care. According to Centers for Medicare and Medicaid Services, about 60 percent of individuals over 65 years old will require some type of long-term care services during their lifetime and over 40 percent will receive care in a nursing home for some period. Along with the ratings, U.S. News has published a series of articles on questions to ask when choosing a nursing home, and how to spot warning signs of bad care, understand how the federal Affordable Care Act affects senior care, and otherwise manage the emotional and financial challenges of dealing with an aging loved one.